I pumped the tires on the Catrike up to 85 PSI, grabbed my gear, put it all in the truck and headed off to Bluffton. In that gear is a new toy to try out today. An Oregon Scientific Helmet Camera is new to the gear bag and I have never used it except to bother the Irish Setter for the three days since the camera and accessories arrived. I had been thinking such a gadget would be nice to have for these rides, but had not had the courage to price them. I found that there was a huge array of choices, including some very NCIS-like dark sunglasses which also had a camera embedded. They were sorta big and clunky (like a cross between Buddy Holly and Men in Black – style) and had limited storage so I passed on those and went for the Oregon Scientific ATC3K which supports up to 4GB of SDHC add-on memory. The camera, cables, several mounting brackets/straps/velcro patches and a 4GB card set me back under $110 delivered. So now to use it. I mounted the camera on the right-hand side of my helmet for this trip. Stopping in at the Bluffton Store I bought a couple of bottles of water and a power bar and asked permission to leave the truck in their parking area while I was off riding the trike and drinking wine. Then I headed off North on RR2241. The first mile or so climbs gently, providing a nice warmup. 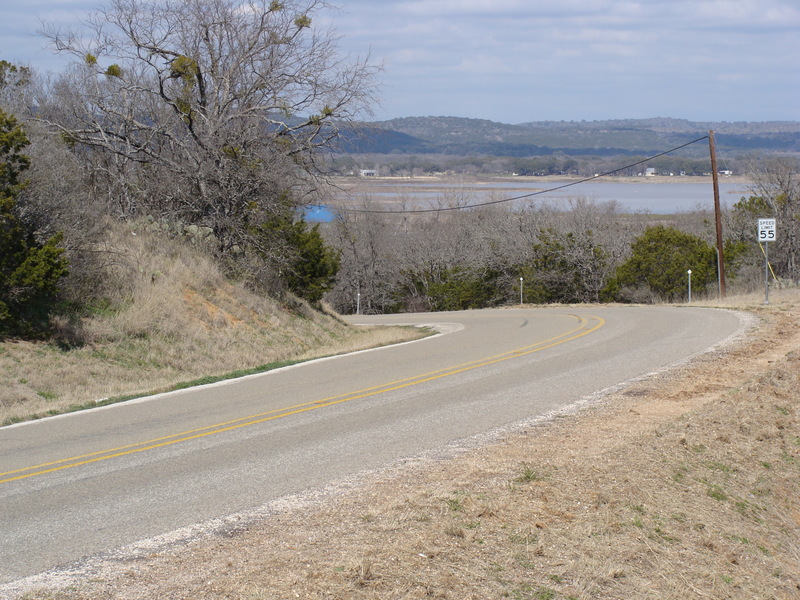 After passing the turnoff to Llano County Road 217 the road tilts gently downhill and I was able to crank things up to 18-20 mph for several minutes, while keeping my heart rate under 130. At 3.7 miles there is a Y in the road. I stayed left, which kept me on RR2241. There is a good downhill that I fairly shot down. It was not scary until I thought about the climb back up it on the return trip… after having enjoyed some wine tasting at the vineyard. Hummm gotta keep that climb in mind while hanging about the tasting bar later. As I started down the hill I also got my first good look at the upper reaches of Lake Buchanan on this ride. While the recent rains have raised the lake by about 15 feet, it still has about that much more to go to be full, so the slews I crossed were still dry, with docks sitting forlornly on dry lake bottom. Zipping along at a good clip I passed the Tow Post office, numerous fishing cabin rental places, camp grounds and assorted private residences. 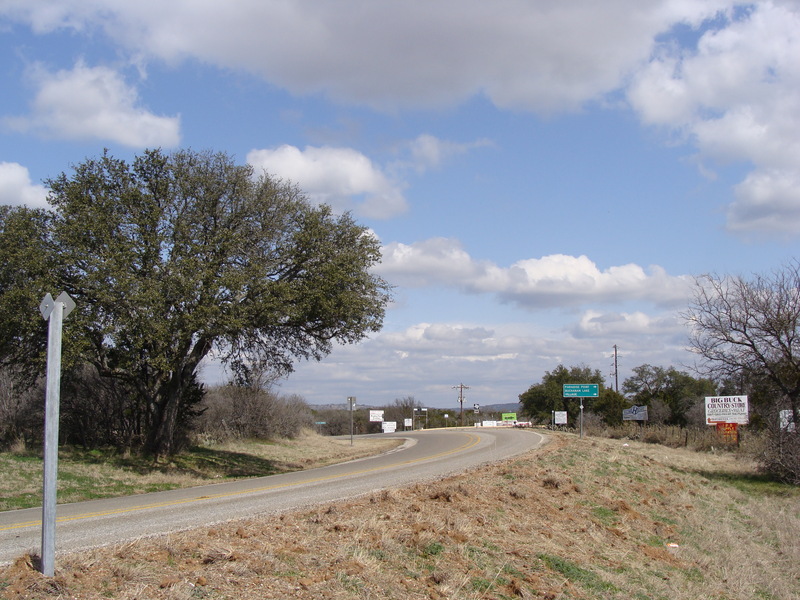 Eventually RR2241 sorta plays out, narrows and becomes Llano County Road 222 (go straight through all the confusing maze of signs just before the Tow Church of Christ and you will be OK (leave the church to your RIGHT side). At this point trees have been allowed to grow closer to the road and for a few hundred yards the term “tree-tunnel” came to mind. Even in February there is a lot of green down in the valley where Tow is located. I just followed the road around a couple of turns and at 7.1 miles the gate into the Fall Creek Vineyard was on my right. 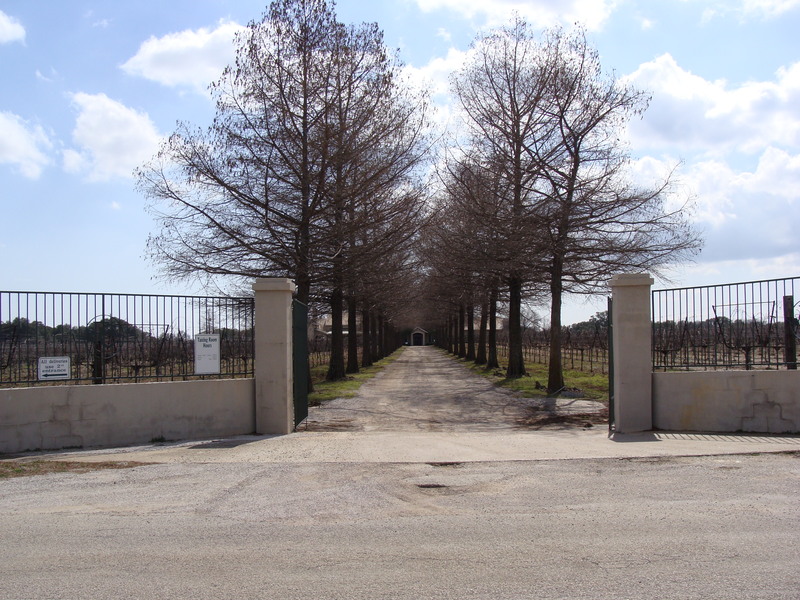 The road into the Vineyard is tree-lined and leads straight up to the main building. Recent rains have done a minor number of the vineyard’s decomposed granite road so I had to dodge a couple of water filled tank traps that I am sure will be repaired as soon as the weather allows the road to dry out. In the video which appears later in this ride report the reader can share the experience of dodging one of those obstacles as I left on the return trip. The ride was well worth the effort. I parked the Catrike in a grassy area, figuring it would not be as likely to get run over as if I parked it in a regular parking place. Upon getting extracted from the seat, and checking the helmet cam I discovered that I had not been successful when I tried to turn it on, so… bummer, no video of the ride TO the vineyard. Then I went in and joined a very relaxed crowd who were standing around the tasting room trying out various wines. They also have snack items for sale in the tasting room. I saw some bags of trail mix and similar items but was more interested in that glass of wine I had promised myself. I opted for a glass of Fall Creek Granite Reserve Cabernet. I suppose I should go on about how it was “an unpretentious little Cabernet with just a playful hint of a Bluebonnet nose”, but I won’t. It was good, I liked it. Out on the patio there was an empty table so I stretched my ageing muscles and soaked up the sun while observing the comings and goings of couples (most seemed so young) It seemed that most were there as the male in the pair tried to impress the female with his exertions in bringing her to this fine and beautiful locale to ply her with tasty wines in pursuit of purposes one can only suspect. The setting was idyllic and it was just impossible not to enjoy it. Sipping at my wine, I found that after a bit less than a half hour I would either need to purchase another glass or screw my courage to the sticking place and confront the ride back, the highlight of which was sure to be the dreaded climb out of the valley. While riding a trike reduces the risks of drinking and pedalling, I decided to hold at one glass and mount my trusty steed for the return ride. The ride back was pretty darn nice in spite of that dreaded climb. The video clip below will give you a brief sense of the adventure. It would be nice if that helmet cam had image stabilization, but hey! For one hundred bucks, it worked plenty good. I need to experiment with places to mount it other than on the helmet, lest we all suffer repeated bouts of Mal de Mar. As I arrived back at the Old Bluffton Store, some people were standing around a car parked near my truck and they wandered over and wanted to hear about the ride, the strange looking contraption on which it had been taken, and where they might find themselves such a fine piece of transportation technology. One big old boy ( he was bigger than my cousin Glen, who we used to call Mongo!) commented that he believed he could ride one of those after a second six-pack since falling off had to be as hard as just getting off appeared to be. All in all, it was a good ride of 14.4 miles, which my heart rate monitor suggested burned 990 calories and I did the whole trip, including time sipping wine, in an hour and 56 minutes. Maybe I should have had that second… well no. This was just a great and easy ride. I hope some of you will join me on it sometime soon. Let me know. 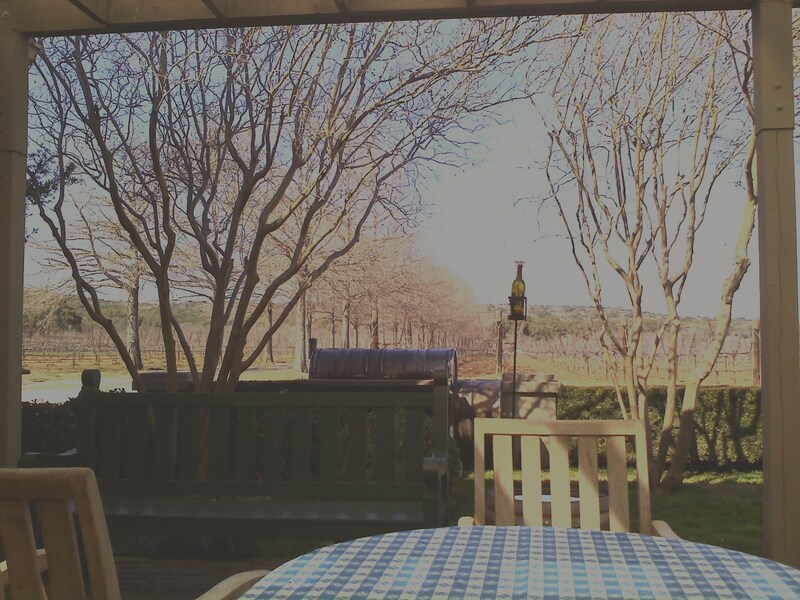 This entry was posted in Cycling - Ride Logs, Cycling, Sailing and Surviving in The Texas Hill Country and tagged Catrike, Fall Creek Vineyards, Texas Hill Country. Bookmark the permalink. That was very entertaining! I’m looking forward to reading and seeing more. Happy Valentine’s Day to you and Peggy! 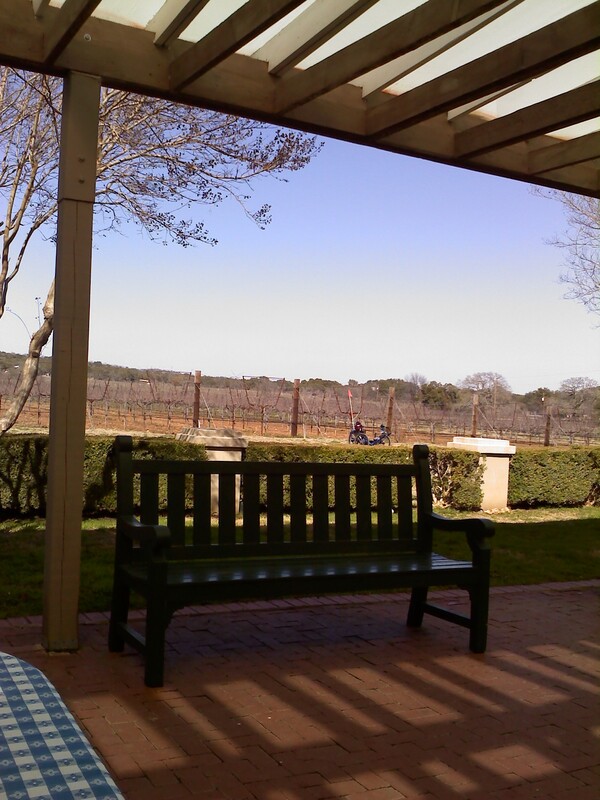 Lavonne… I will be adding a few phtos to the Vineyard Ride report this afternoon. Very cool. We’ll have to do some of these rides this summer. Darn you, I can’t let you have a toy ahead of me! I’ve toyed with the helmet cam idea for a long time for the Beemer. That’s a very nice price and it did a good job. BUT, I will not be giving up the motor for the pedaling machine. Nice ride there. That little Bluffton store your Mom must have been speaking of has such a selection in such a small space that it could legitimately be called a “nano-mall” in today’s techie terminology.